Welcome to The Love Boat Official Walkthrough! Based off the hit TV show, take a cruise down memory lane with Captain Stubing and his crew. 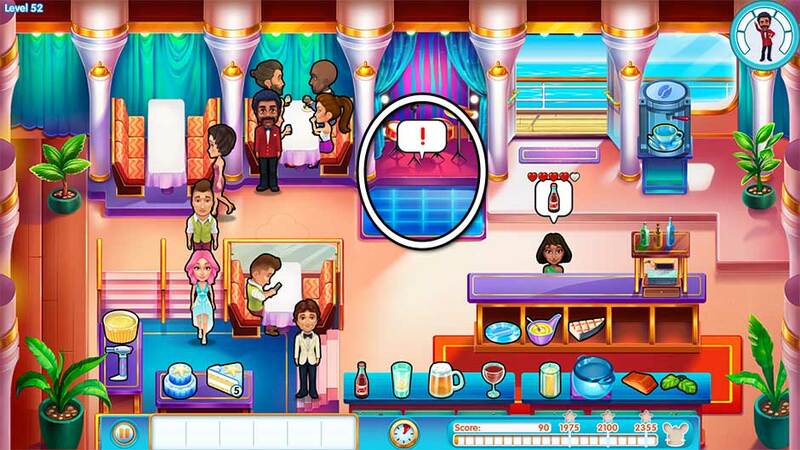 It’s a voyage of comedy and romance with guest appearances from your favorite GameHouse Original Story characters. This official walkthrough contains in-depth strategies, tips and tricks for all levels. Find all hidden mouse locations and unlock all the achievements with our comprehensive guide. Select one of the topics from the Contents list below to get started! Welcome to the tips and tricks section of The Love Boat walkthrough. This section covers all the basics, how to play, and tips you need to know to earn the best scores. The Love Boat is a time management game. The goal is to serve customers as quickly as possible to earn high scores. 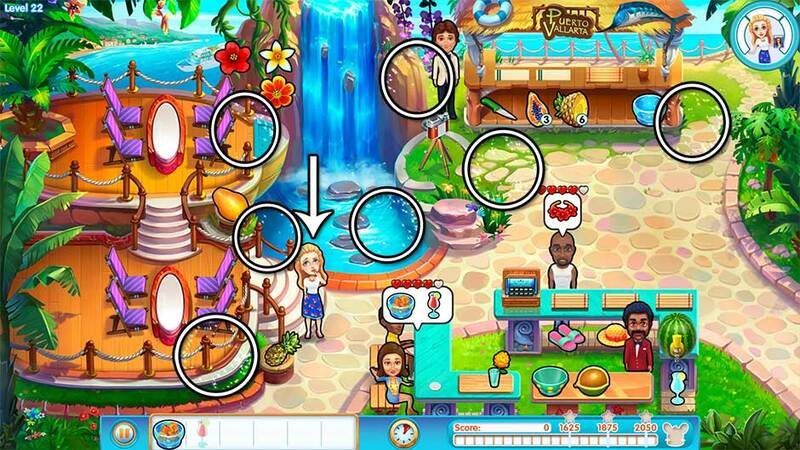 When customers appear and order, a bubble will appear over their heads displaying their order. Click on the matching products, then click on the customer to bring them their order. 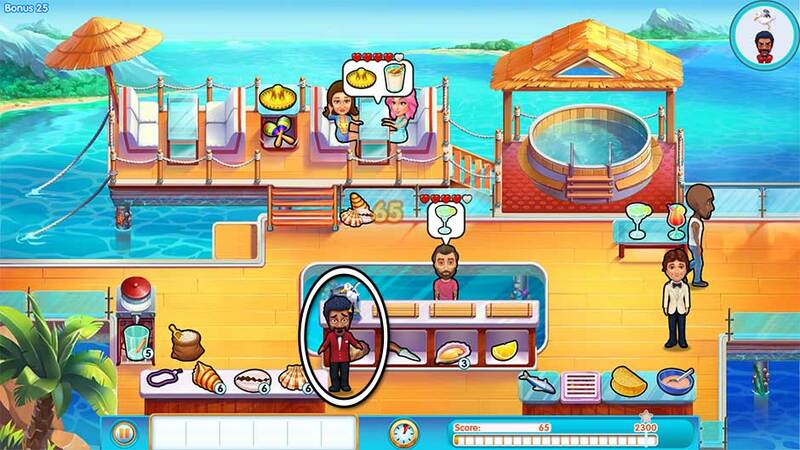 Once an order has been served, click on the cash register to check out the customer and collect payment. It’s that easy! Every customer has a number of hearts displayed over their head. The more hearts a customer has, the happier they are. A customer can have up to 5 hearts. If a customer loses all their hearts, they will leave without paying. Serve customers quickly and bring them the correct orders to increase their happiness and your score. Earn additional bonuses by serving customers quickly, bringing them their entire order in a single trip, and checking multiple people out at once at the cash register. 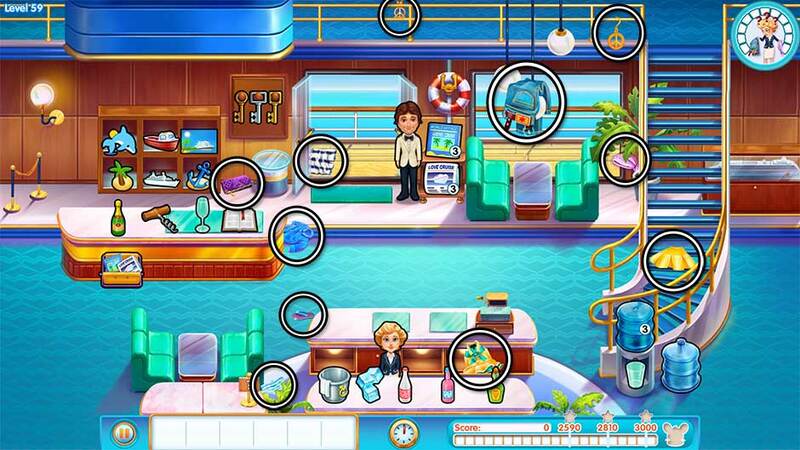 Carl the mouse is hidden in each of The Love Boat’s 60 story levels. Mouse locations are random. A level’s mouse can turn up in any number of locations. For help finding a level’s hidden mouse, visit the Mouse Locations section. After selecting a level in the game’s level select map, you’ll be given the option to purchase upgrades. Earn money for upgrades by completing levels. The higher the score, the more money you’ll earn! Upgrades offer several unique bonuses to make your gameplay more rewarding. Swab the deck! – Cleaning tables makes room for new customers and adds to your score. Full provisions! – Restock any items that have limited stock at the start of the day to give yourself and advantage. The diamond standard! 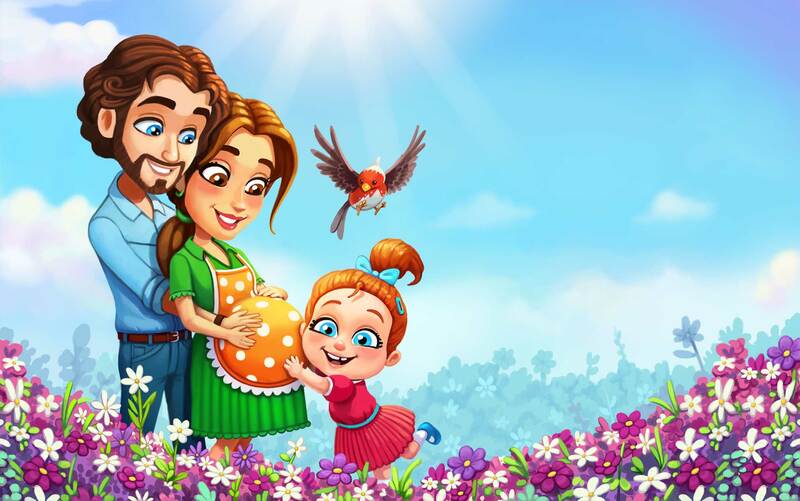 – Complete story level and bonus level challenges and goals to earn diamonds. Diamonds can be used to purchase special costumes for Carl the mouse. Sneaky stowaway! – Carl the mouse is hiding in each of the game’s story levels. Listen and keep an eye out for him and click on him when he appears! All-inclusive cruising! – Become a multi-tasking master! You can continue to click on items ahead of the actions your character is performing to maximize your time and efforts. Welcome to The Love Boat Official Walkthrough! This guide covers every part of the game: level strategies, bonus level tips and tricks, mouse locations, achievements, and more! Scroll up to the Contents section above to get started, or keep scrolling to dive right in. There’s a lot of paperwork to take care of before you can set sail! Sort it all out before your shift ends! Welcome aboard! Seeing as this is your first shift, there’s a few basics to cover. First, the key. Some customers who walk in today will ask for the key. It’s hanging on a peg toward the upper left corner. Bring the key to the customer. Once they’re finished, they’ll bring it back and leave it on the counter. Click on the key to sort it back to the peg. Second, luggage! Some customers will leave their luggage lying around. When you see an orange suitcase sitting on the floor, click on it to have Gopher store it away. Picking up suitcases isn’t necessary, but will add to your score. Third, drinks! To serve a glass of champagne to a customer, first click on the bottle on the counter on the upper left. Next, click on the corkscrew to open the bottle, then click the glass to pour it. You can restock magazines by clicking on the drawer beneath the champagne bottle. In addition to helping customers, there’s a special goal for today. There are documents you’ll need to sort before your shift is over. The documents are located on the counter on the left and marked with a “!” bubble. Click on the documents to begin sorting them. A meter will appear showing your progress. Click on the documents to sort them every spare moment you’re not helping a customer. Sort all the documents before the end of the day to earn a diamond. Tip! Gopher will pick up luggage and clean tables, leaving you more time to serve customers and sort documents. Stacey’s special order requires some hard to find ingredients, better start looking! 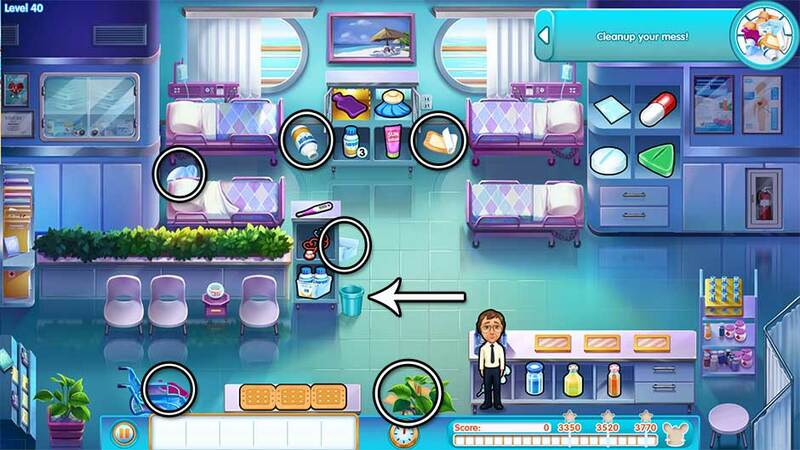 Collect the ingredients scattered around the Lobby. You can carry up to 3 at a time. 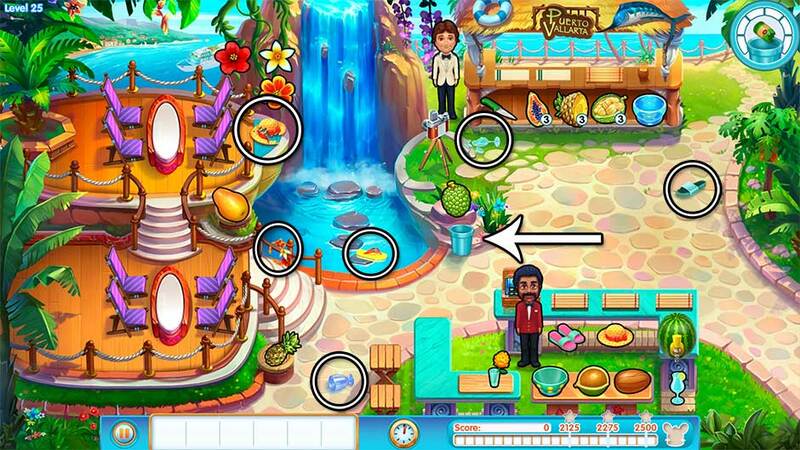 Once you’ve collected the ingredient(s), click on the counter below the cash register to set them down. You’ll need to click once for each ingredient you’re carrying to set it down. Find all the ingredients and set them on the counter to complete today’s goal. The ingredient locations are pictured below. Keep Gopher away from the omelet! There is an amazingly tasty-looking omelet sitting on the counter below the cash register, and Gopher has his eye on it. Keep your eye on Gopher. Whenever he moves away from the door and toward the omelet, a “!” will appear over him. Click on him to shoo him away from the delicious omelet. Do this successfully 3 times before the end of the day to earn yourself a diamond. Level 4 – High Standards! Organize the cutlery to supply the ship before your shift ends! 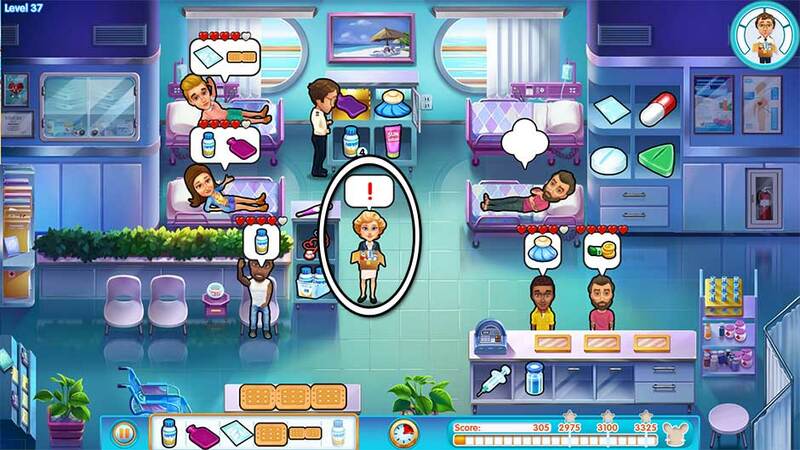 Similar to the challenge in Level 1, today you’ll need to finish sorting cutlery before your shift is over. Click on the silverware on the counter on the lower left marked with a “!” to begin sorting. A meter will appear displaying your progress. Successfully sort all the cutlery between serving customers to earn a diamond for today’s challenge. Level 5 – Dealing with the Past! Help Sandy hide the magazines without Brad noticing! Keep Brad’s attention away from Sandy while she hides the magazines. Whenever Brad starts to notice Sandy, a “!” will appear over his table on the left. Click on the table to distract him! Do this successfully 4 times before the end of the day to earn another diamond. 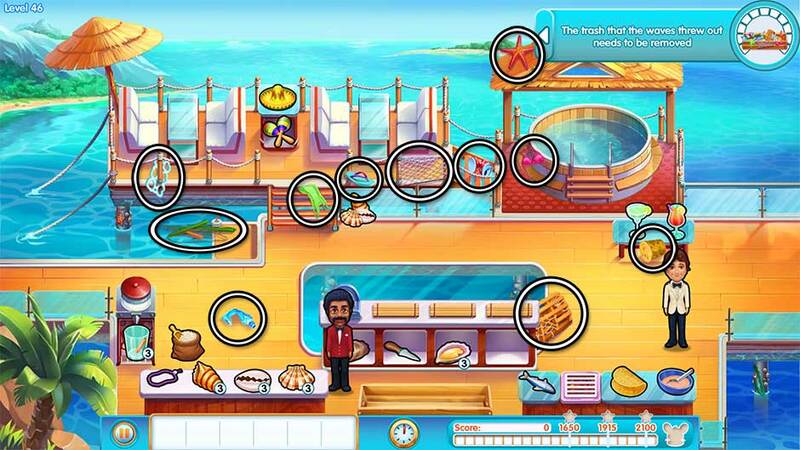 Level 6 – Makin’ Waves! There was quite the splash in the pool. Better clean it up before something happens! Clean up the puddles around the pool. There are 6 in total. Click on a puddle to mop it up. You’ll need to clean up all of them before the end of your shift to earn a diamond. Their locations are shown below. Tip! Gopher can still help clean tables while you’re mopping up puddles. Careless people keep leaving their things in the pool. Fish them out! Fish out the garbage left in the pool. Throughout the day, pieces of trash will float to the surface in the pool. Click on them to clean them up! You’ll need to do this 3 times before the day ends to earn a diamond. There’s a stowaway trying to get inside! Catch the stowaway! He’ll pop up all over the place frequently throughout the day. Every time he appears, quickly click on him to catch him! You’ll need to find him 12 times before day’s end to complete today’s challenge. Isaac is not going to encourage his coworkers goofing around and slacking off. Don’t serve your fellow crewmembers. Every time one of the crew shows up at the register, simply ignore them. They will eventually walk away. Serve everyone else as per normal, keeping in mind you won’t be able to make combos quite as large at the register today whenever a crew member’s around. New today is the juicer, located on the counter island toward the upper left. To make a glass of grapefruit juice, click on the grapefruit on the counter twice to fill the machine. You will need 2 fruits to make a glass of juice. Make sure the seagulls don’t interrupt Stacey’s meal with a nasty surprise! Keep a sharp eye on the seagulls today and shoo them away when they start to bother customers. Seagulls will land on the ship’s railing, and a “!” will appear over their head. Click on the seagull before the meter empties to shoo it away successfully. Repeat this throughout the day to earn a diamond for your troubles. A restaurant is no place for stray Kittens. Find the Kitten magazines hidden around the restaurant. 3 of the 4 magazines you’ll need to find are lying around the restaurant. The last one is in Brad’s hands. At some point during your shift, Brad will enter reading the magazine. Click on him to collect the final one and complete today’s challenge. All magazine locations are shown below. See Angela succeed in her endeavors. Have Angela fix up Emily’s makeup! Throughout the day, a “!” will appear over Emily and Angela’s table. Click on them when this appears to have Angela help Emily with her makeup. You’ll need to do this a total of 4 times today to complete the challenge and earn a diamond. 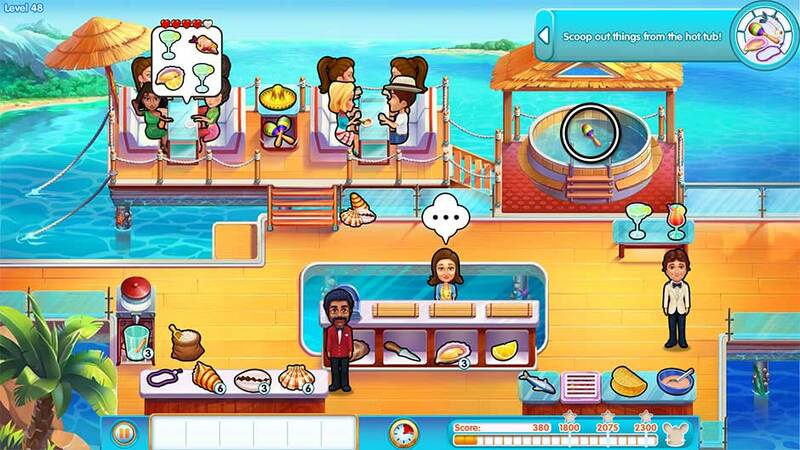 Keep serving the VIP guests at the captain’s table. 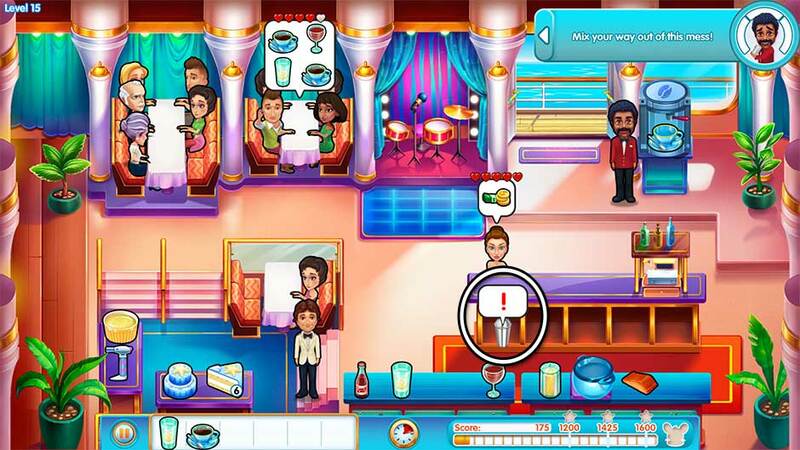 Serve the VIP guests complete orders only! This means you will have to bring them everything they ask for in a single trip. Every time this table orders, stop everything! Your priority should be on serving them. If you have any spare items on your tray, deliver them quickly and focus on serving the VIPs. You may want to consider keeping an item or two premade on your tray to move things along quicker if you’re struggling with timing. Remember you can remove an item from your tray by clicking on it. Level 14 – Volatile Seas! Work to avoid a fight between Stacey and Stubing! 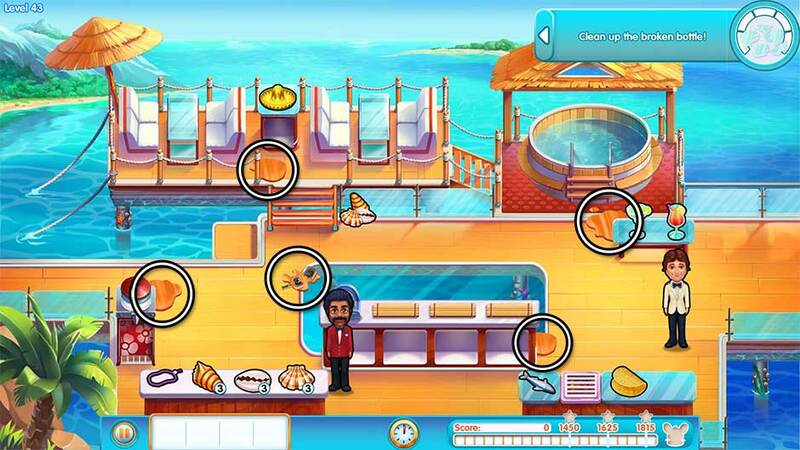 Defuse the Captain’s table when signs of trouble arise! After delivering the first order, signs of trouble will start to emerge. Every time a “!” appears over the Captain’s table, quickly click on it to ease the tension. Isaac will go to the Captain’s table (after delivering any prior orders) and defuse the situation. You’ll need to do this a total of 4 times today. Level 15 – Bermuda Swizzle! Take the VIPs’ minds off the disasters of the dinner. Mix your way out of this mess! Mix drinks for the VIP table 3 times today. Click on the drink mixer beneath the checkout counter every time the “!” bubble appears. Isaac will go mix drinks for the VIP table. 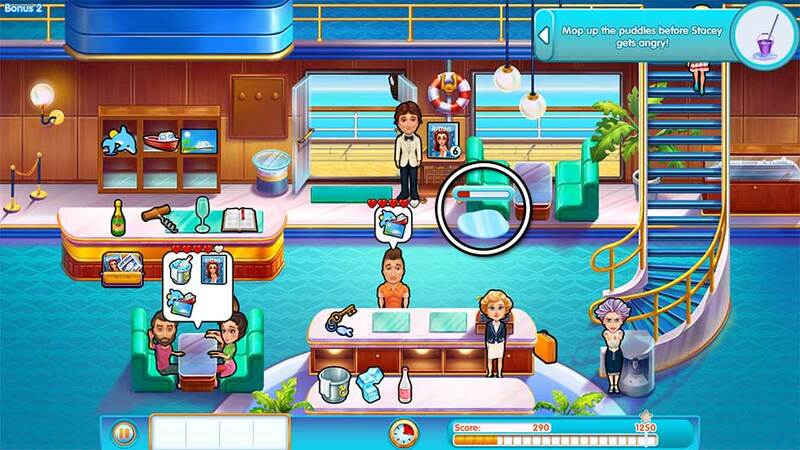 Keep in mind you will not be able to help customers while mixing drinks, though Gopher can still clean tables. 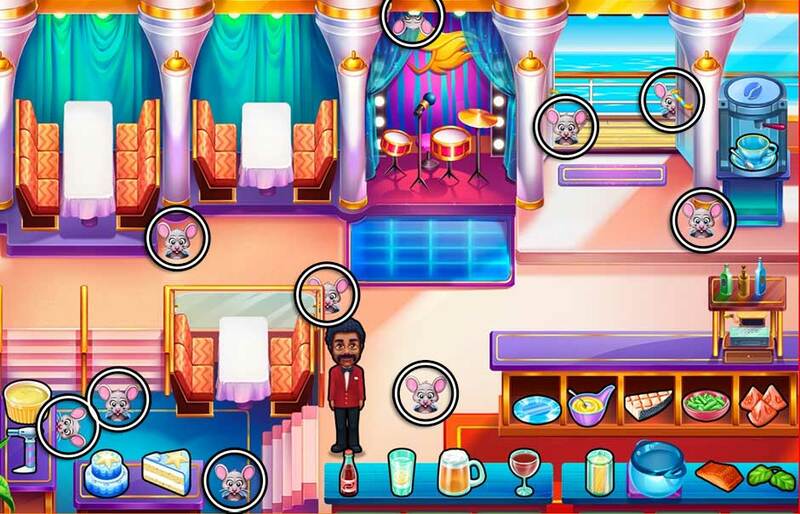 Mix 3 of the best drinks ever before the end of the day and you’ll earn a diamond for your skill. There’s an unexpected visitor in Puerto Vallarta! Welcome to Puerto Vallarta! Things here work a little differently than the ship. 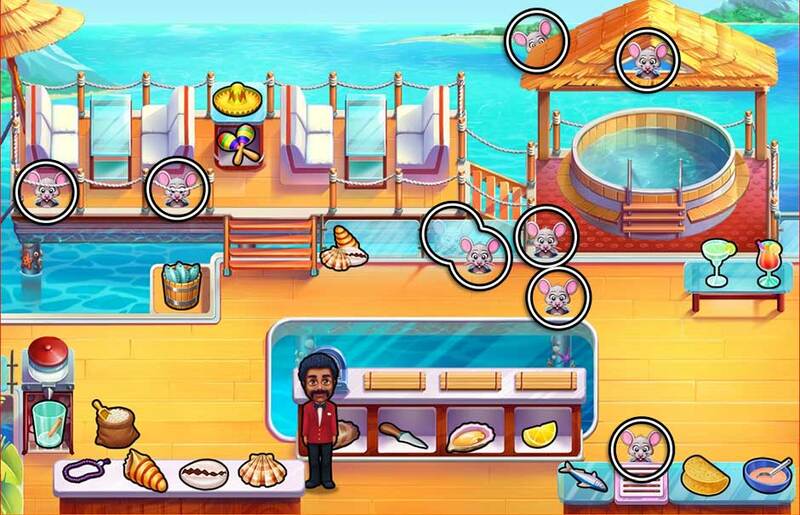 First off, you can restock the fruit at the cocktail bar by clicking on the fruit on the pedestal near the customer tables. You can also take photos of tourists by using the camera near the top of the screen. 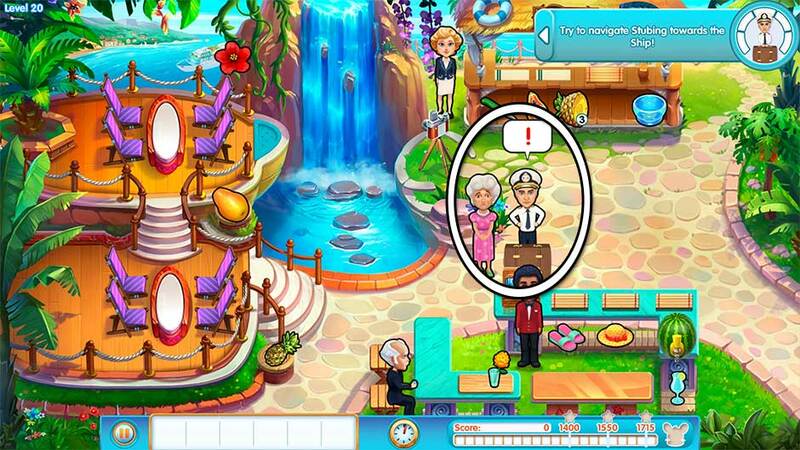 Today’s diamond challenge is to help Jenny gather enough courage to talk with Ron. Jenny will wander away from the table on the left now and then and go to the center of the screen. There she’ll stop, holding her arm and looking insecure. Click on her while she appears this way to encourage her to return to her table, and the support of her friend. Do this a total of 4 times today to earn a diamond for your efforts. After all, good friends are just as precious as diamonds, aren’t they? Shaky relations on solid land. Time for a little girl time. Have some of the guys join the girls and have drinks with them. Eligible guys will show up in pairs throughout the day. When an icon of the girls pops up over their heads, click on the guys to have them join the ladies. Bring them their order. It’s only after the guys leave that the progress will count toward today’s goal. Do this a total of 4 times today to earn a diamond, you matchmaker you. A famous chef is coming to Ensenada! Help Isaac find the perfect spot to set up the flyers for the event! Find the perfect spot for each flyer and put them up. A “!” will appear over the stack of flyers beneath the register when one is ready to hang. Click on the stack to add a flyer to your tray. An arrow and flyer outline will then appear somewhere in the location. Click on it to hang the flyer. Do this a total of 5 times to complete today’s challenge. Brad mustn’t see the Kitten Magazine! 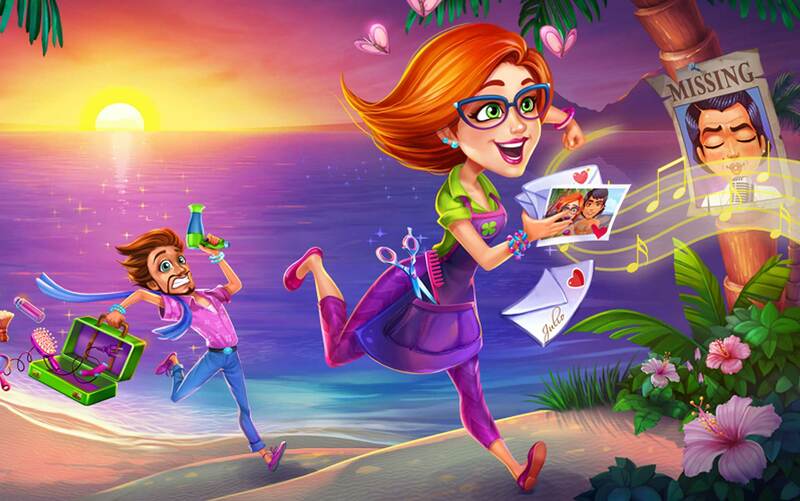 Help Sandy distract Brad with love and drinks. Click on their table whenever a “!” bubble appears. 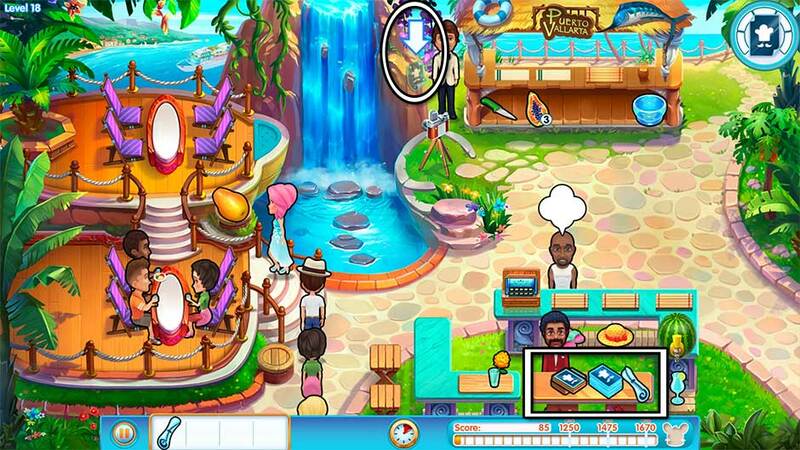 Complete the tasks shown in the bubble and following dialogue to help keep Brad distracted. You’ll need to do this a total of 4 times today during your shift. The crew is trying to show Stubing’s good side to Aubrey. Try to navigate Stubing toward the ship! Click on Stubing every time a “!” bubble appears over his head. You’ll need to do this a total of 5 times today to complete today’s challenge. 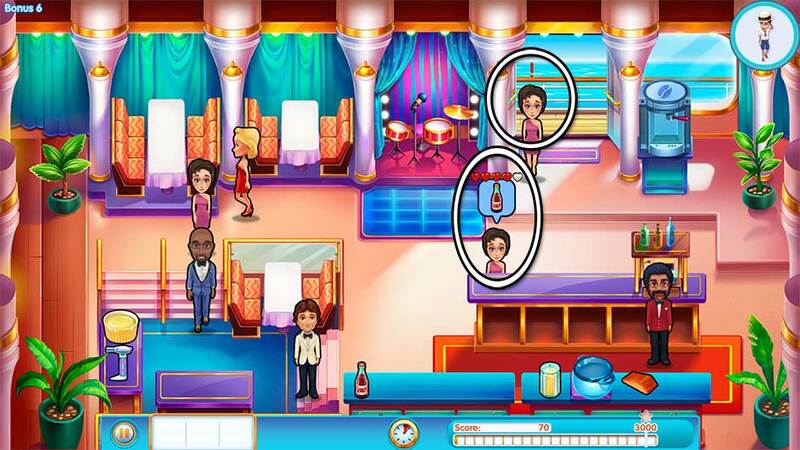 Level 21 – Girls’ Night Out! The rule may say that you should let them come to you, but even guys need a push sometimes! Help the guys introduce themselves to the girls. Men will wander into the scene from the upper right corner during the day. When they stop and a “!” bubble appears over their heads, click on them to have them go talk to the girls. Do this a total of 3 times today to complete today’s challenge. Sandy is searching for the rest of the Kitten Magazines. Help Sandy check all the highlighted locations for hidden magazines. 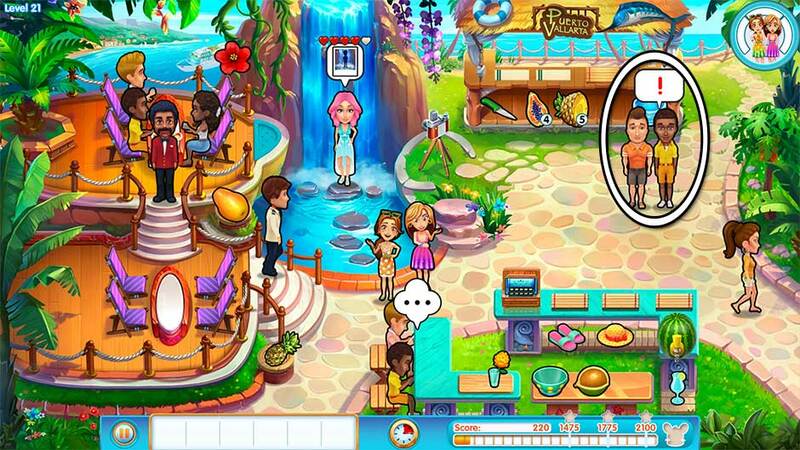 A “!” bubble will appear over Sandy’s head every time she’s ready to check a new location. After clicking on her, several locations she can check will appear in circular, sparkling areas. Click on an area to have Sally check for magazines. Magazine locations are random, but after repeating the process until she finds all 3 magazines, you’ll earn yourself a diamond. The crew is preparing for the party! Watch out for party supply deliveries. Your fellow crewmate will be making the deliveries. When she appears in the upper right corner, a “!” bubble will appear over her head. Click on her to accept the party supply delivery. Accept 4 deliveries before the end of your shift to complete today’s challenge. Jenny and Matt are getting to know each other. Serve Jenny and Matt throughout the day. The two will sit at the table in the lower left corner. Serve them just as you would any other customer, though be aware they will make multiple orders throughout the day. Successfully bring them orders without them becoming upset or impatient and you’ll earn a diamond for your top-notch service. The party sure was wild, but now somebody has to clean up this mess. Clean up the mess now that the party’s over. Find the 6 pieces of trash scattered throughout the area before the day is done. Their locations are shown below. Click on the pieces of trash one at a time to collect them. After picking up a piece, click on the waste basket to thrown it away. Repeat this process for all 6 pieces, leaving the area sparkling like a diamond by the end of your shift. Doc’s Office has been ransacked! Find the missing equipment and put it back where it belongs. Retrieve your ransacked supplies from around the office. There are 4 different supplies that have gone missing. Locate the supplies. Once you’ve found one of the items, an arrow will appear showing you where it should be placed. Click on the cubby indicated to put the equipment away. Find and put everything away before the end of your shift to complete today’s challenge. The item locations, and where they should be placed, are shown below. It’s prime time for Sandy and Brad to have a talk! Listen in on Brad’s attempts to talk with Sandy. 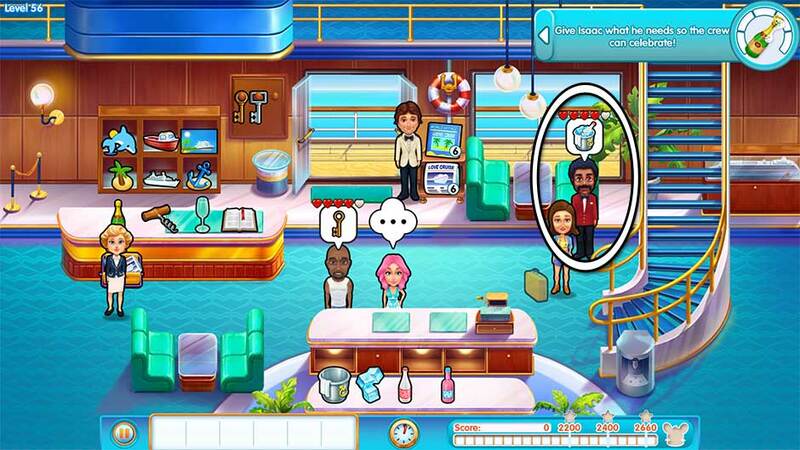 A “!” bubble will appear over Brad every time you can eavesdrop on their conversation. Click on Brad when this symbol appears to listen in. Do this a total of 4 times before the end of the day to complete the challenge. Take care not to let one, or both of your patients wait too long or someone could get quite upset! Both the Captain and the Owner aren’t feeling well, and it’s very important not to play favorites! Serve both their full orders at the same time, back-to-back. You will need to do this throughout the day, so make sure to keep your supplies stocked! A patient with strangely familiar symptoms has come in. Check up on Jenny. Jenny will sit in the waiting area on the lower left. A “!” bubble will appear over her head every time she needs a checkup. Check up on Jenny a total of 3 times today to complete today’s challenge. Wake up the patients so you can tend to them. Some patients arriving will immediately fall asleep and a “Zzz” bubble appear over their heads. You will have a limited amount of time to wake them up, so tend to them right away! You will have to wake the patient up before you can treat them. Repeat this process throughout the day successfully and you’ll earn a diamond for completing today’s challenge. Time to be economical and ecological! Prepare only what you need! No trashing today! Don’t trash any products today. Take your time and be especially careful when picking up customers’ orders. The club soda is the most likely area where you may encounter difficulty, so pay extra close attention. As long as you don’t remove any items from your tray, the rest of today will be smooth sailing. When one of your guests is feeling low, it’s up to you to try and lift their spirits! Today’s challenge is to cheer up Jenny, who is sitting on the bottom edge of the pool. Jenny will ask for drinks throughout the day. When her order bubble appears, make the drink she requests and bring it to her. Repeat this a total of 6 times during the day to complete the challenge and earn a diamond. The inflatable balls should stay well-stocked, and don’t let the crocodile pop! Keep the inflatable balls stocked and prevent the crocodile from popping. 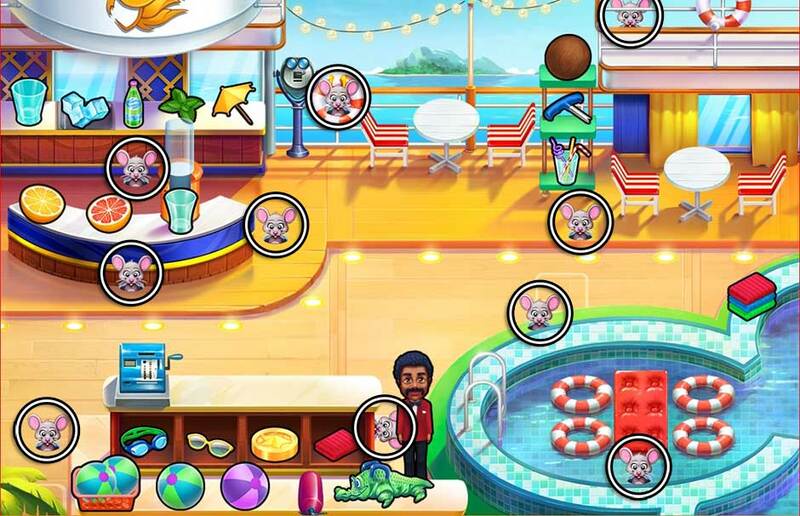 Click on the basket on the left side of the counter to restock the inflatable balls. It’s a good idea to do this as often as possible, especially at the start of the day! Each time you need to inflate the crocodile, pay extra close attention and make sure he doesn’t pop! If you can get through the day without running out of stock of the inflatable balls, and without the crocodile popping, you’ll earn a diamond for your efforts. Tip! 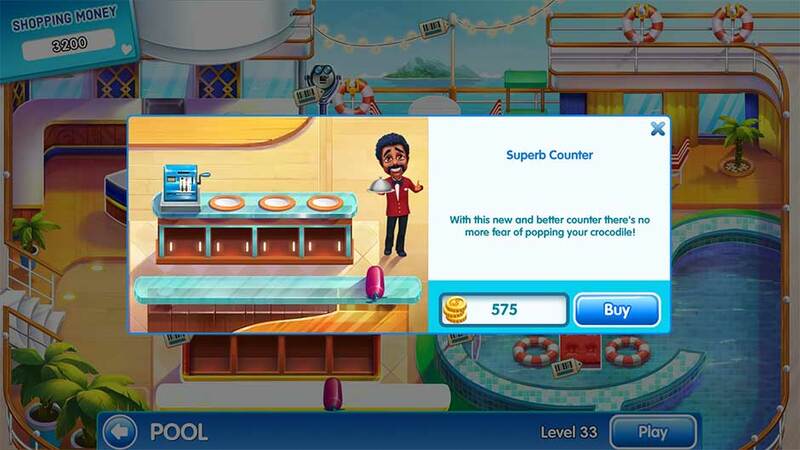 Purchase the Superb Counter upgrade and you won’t need to worry about popping your crocodile! Level 34 – Wombo Combo! Isaac’s got to step up his game once more. To show he’s the greatest, only combos and bonuses will count! Only combos and bonuses will add to your score today. Purchasing upgrades at the start of the level will help make this easier. Nevertheless, focus on serving customers full orders quickly. This is the best way to quickly add to your score. 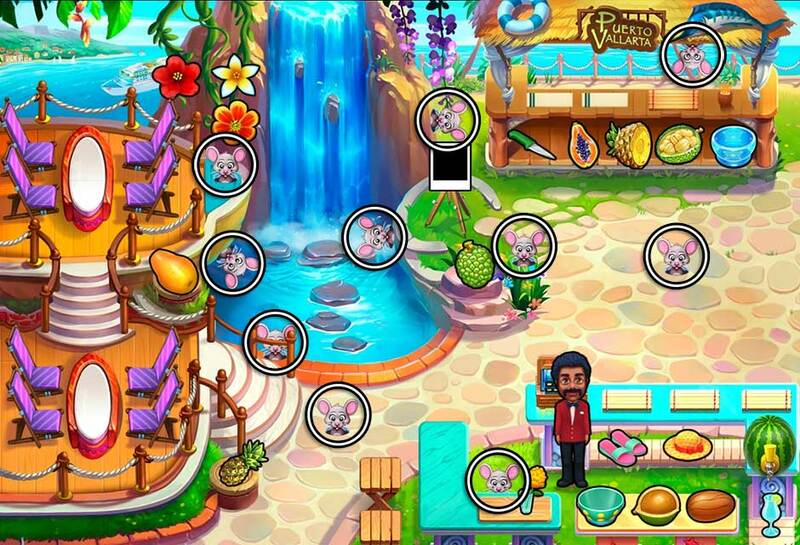 When checking out customers, check them out in groups for added bonuses, and don’t forget to clean those tables! On a summer day it can get very hot. But don’t let any fire spread! Put out the fire on deck! Click on the water bucket next to the pool, then click on the magazine to put out the fire. Try to pick up the magazine, and it’ll fly into pieces. Collect the remaining 6 pieces scattered around the deck to complete today’s challenge. Their locations are shown below. Even Doc’s got a lot of paperwork to deal with! Medical supplies won’t order themselves! Organize all of the supplies paperwork. Click on the stack of papers on the lower left marked with a “!” bubble to organize it. A meter will appear displaying your progress. Successfully fill the meter and sort all the papers before the end of the day to complete today’s challenge. The supplies have arrived, as ordered! But there’s still the matter of carrying the supplies! Bring in all of the medical supplies! Packages will arrive throughout the day. When the courier arrives and a “!” bubble appears over her head, click on her to collect the package. Keep in mind you won’t be able to help any customers while moving the package, so try to finish any previous tasks before you pick it up. Successfully pick up all 4 packages before the end of your shift to earn a diamond. With all the supplies in office, it’s time to organize them! With the medical supplies unpacked, it’s time to organize them! 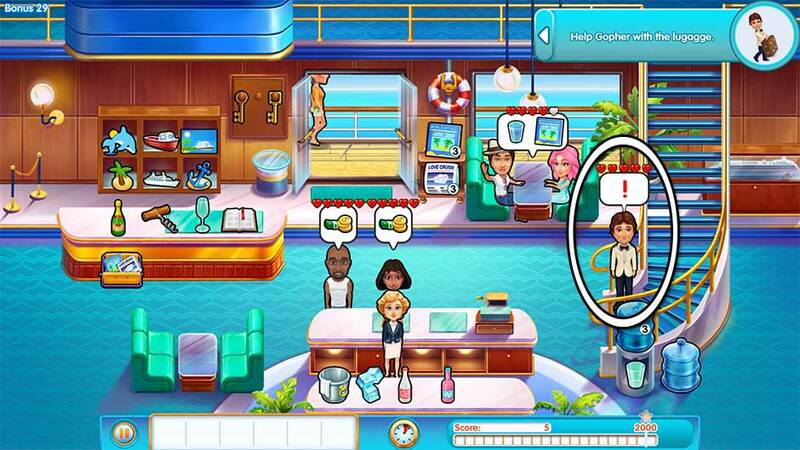 Just like level 36, click on the supplies on the lower left indicated with a “!” bubble. A meter will appear displaying your sorting progress as you go. Focus on sorting the supplies every spare moment you’re not helping a patient. Complete sorting the supplies before the end of the day to complete today’s challenge. 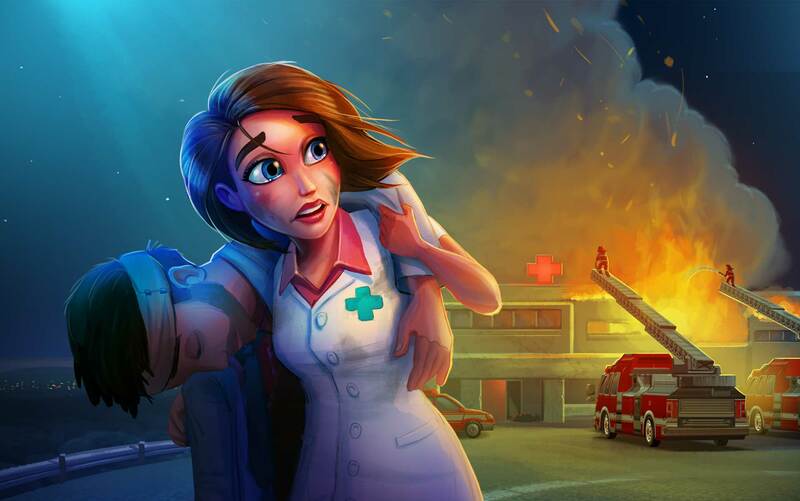 A Doctor must keep his skills sharp, especially in fast-paced emergencies! Doc’s got to be quick! Get those quick bonuses! Today is all about being fast. You’ll need 8 quick bonuses in order to complete today’s challenge. 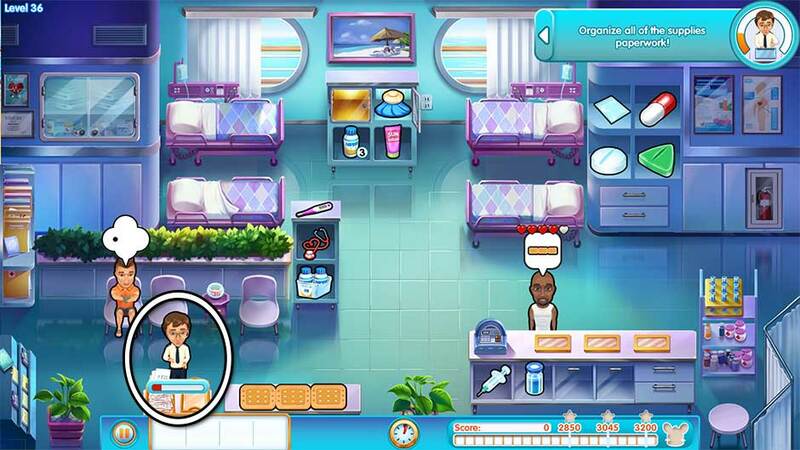 Bring patients full orders quickly after they order in order to earn a quick bonus. It can help to have items that take longer to prepare pre-made on your tray. If you notice an item is popular, try keeping an extra on your tray. If you’re quick, you’ll earn a diamond for your efforts. The drill the day before left a real mess; nothing to do but clean up now! Medical supplies have been left all over the ward, and it’s time to clean up. Click on a piece of trash to collect it, then click on the blue waste bin toward the center left to throw it away. Repeat this for all 6 pieces of trash to complete today’s challenge. Their locations are shown below. The crew wishes to enjoy the beauty of Ensenada as well, but they should keep it to their off-duty hours! Don’t serve the crew! When a crew member orders today, simply ignore them. They’ll eventually leave. Get through the day ignoring your colleagues and you’ll earn a diamond. Level 42 – Shell We? The sea seems to have brought a few shells to shore; they look quite nice, too! Gather the shells! A total of 4 shell necklace pieces are lying around. Find all of them and place each on the counter in the lower left corner. You’ll need to click the counter once per item. Placing an item on the counter will mark it as found. Find all 4 before the end of the day to earn a diamond. Their locations are shown below. Someone made a mess; now it’s your job to clean it up. Clean up the broken bottle! A total of 5 pieces of broken bottle, including puddles, are scattered around the deck. Click on a portion to clean it up! You’ll need to find and clean all 5 pieces before the end of the day to complete today’s challenge. Their locations are shown below. Partying with the guys is well and all, but what girls need now and then is a girl-to-girl talk! Serve the girls! They’re just like any other customer, only you’ll need to continue serving them throughout the day, so timeliness is key! Serve them successfully throughout the day without them leaving angry and you’ll earn a diamond for your top-notch service. In the end, Jenny relaxed and is having a lot of fun at the party! Keep the pair dancing! Every so often, their dance will stall and a “!” bubble will appear over their heads. Click on them to encourage them to keep dancing. You’ll need to do this a total of 10 times today to complete today’s challenge. Tip! Clicking on the pair won’t interrupt your service, so don’t hesitate to click on them immediately once the “!” appears. A small storm has brought up some waves that have thrown out trash around Ensenada. Uh-oh, the trash the waves threw out needs to be removed. Click on each piece of debris to remove it from the dining area. You’ll need to remove all 11 pieces of trash before the end of the day to complete today’s challenge. Their locations are shown below. This seagull is almost a regular, which is fine, as long as he doesn’t disrupt the guests! There’s a seagull who will come visit from time to time. When he shows up a “!” bubble will appear over him. Quickly click on him within the time allotted to shoo him away! You’ll need to continue doing this throughout the day to complete today’s challenge. Tip! Shooing away the seagull won’t interrupt your service, so click on him as quickly as possible when he appears. The jacuzzi seems to be so good, people forget to take all their things with them when they leave! Scoop out things from the hot tub. These items will appear after guests have left the hot tub, so it’s important to serve jacuzzi guests quickly and check them out quickly to have them leave. 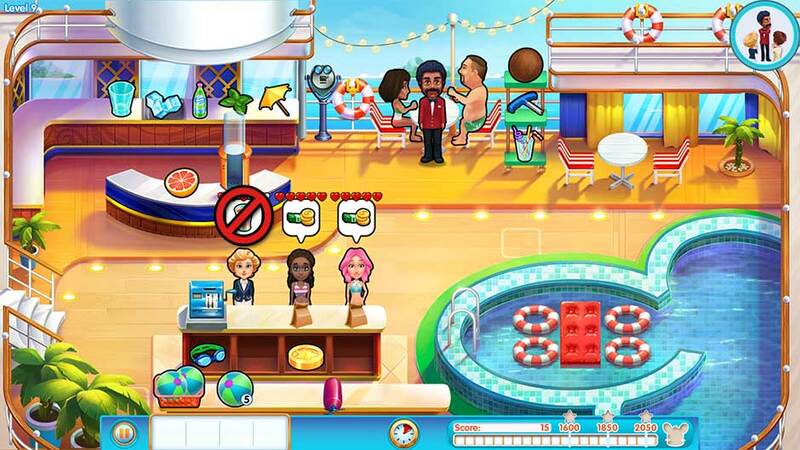 Once the guests have left, click on the item they leave behind in the hot tub to remove it. You’ll need to do this a total of 5 times before the end of the day to complete today’s challenge. Level 49 – At Your Order! Guests can feel awkward if they get their order before others. Time to give full orders only! Give customers full orders today. A full order is when you bring all the items a customer orders (minimum 2 or more items) in a single serving. Customers who order only one item don’t count! Serve 11 full orders over the course of the day to complete today’s challenge. The ship is about to depart, but not everyone is back yet! Try calling for your missing colleague! Call for Gopher and Brad using the megaphone. The megaphone is located on a small table below the cash register. A “!” bubble will appear over the megaphone when Isaac can use it. Click on it to have him call for Gopher and Brad. You’ll need to do this 8 times before the end of the day to complete today’s challenge. Level 51 – On the Double! Finish up the orders quickly to hear what Doc has to say! Deliver orders quickly to hear what Doc has to say! Get 8 quick bonuses by serving full orders within a handful of seconds of their being ordered. If you’re having trouble, try keeping an extra cup of coffee or serving of pasta on your tray to save time. Complete the task successfully to earn a diamond. 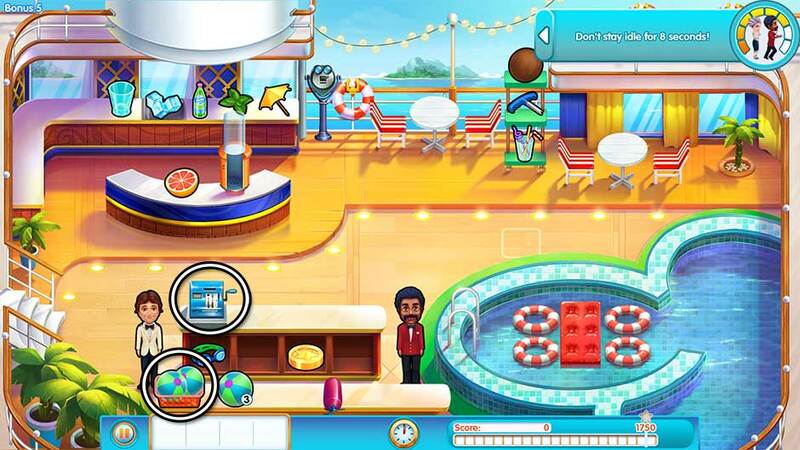 Level 52 – Disco Fever! Music for the wedding is being set up and these tunes really make you want to dance! Let Isaac take a break on the dance floor! Whenever a “!” bubble appears over the dance floor, click on it to let Isaac bust out some sweet moves. But be careful! While Isaac’s dancing, you won’t be able to serve customers until he’s finished. Let Isaac dance 5 times before the end of the day to complete today’s challenge. 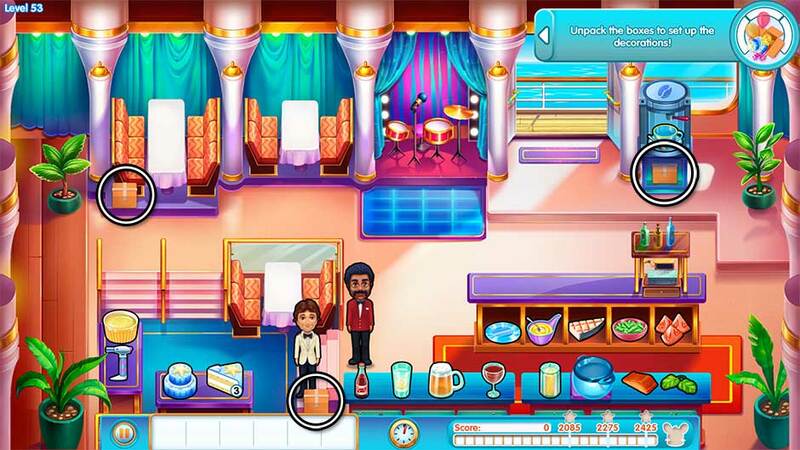 Level 53 – Prepare the Wedding! The decorations have arrived, now it’s time to open up the boxes and prepare for the wedding! Unpack the boxes and set up the decorations! There are 3 boxes lying around the restaurant. Click on a box to start unpacking it. A meter will appear displaying your progress. Once you finish, the decorations will be set up! Do this for all 3 boxes before the end of the day to complete today’s challenge. Their locations are shown below. Tip! If you’re quick, you can unpack all the decorations at the beginning of the day without keeping your customers waiting. However, if you’re struggling for time, wait until the very end of the day to unpack the boxes. If you still have 1 customer left, you’ll be able to continue unpacking. Level 54 – Row of Products! The wedding is on! Time to give your best service to the bride and groom! Serve the bride and groom so they have a great time! The happy couple will be seated at the upper left table. They’re just like any other customer, only they’re especially important because today’s their big day! Don’t panic, just serve them full orders in a timely manner and you’ll earn a diamond as big as the one on the bride’s finger. Level 55 – Where is Isaac? 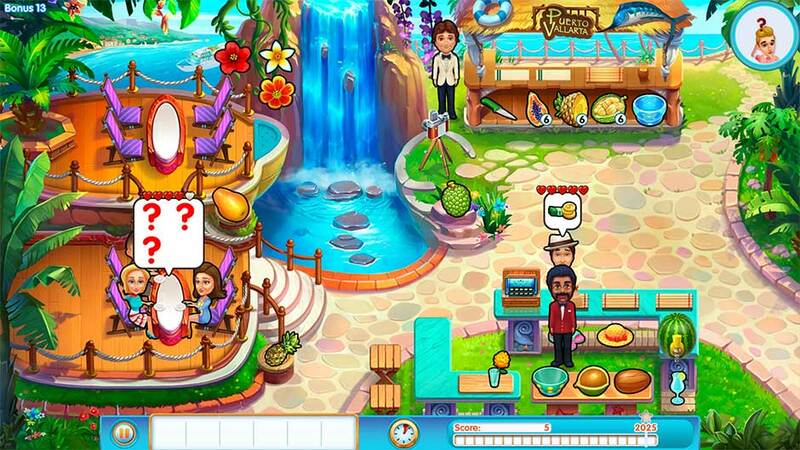 Make sure to cater to your guests as fast as possible so they don’t leave a bad review! 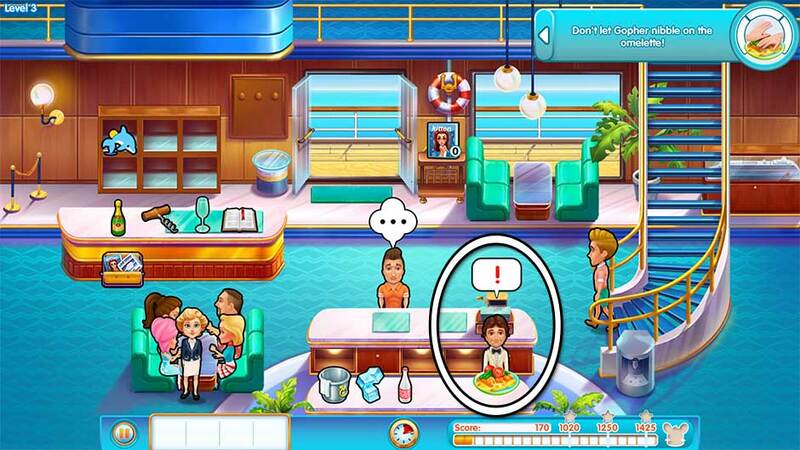 Help Emily serve the angry customers without anybody leaving! There will be 3 angry customers already at the start of the day. Focus on serving the two that aren’t at the counter first, and quickly! Then immediately serve and check out the counter customer. Give Isaac what he needs so the crew can celebrate! Watch for Isaac as he enters the Lobby. Just like a customer, a bubble will pop up over his head displaying the item he needs. Bring Isaac the items he asks for 5 times before the end of the day to complete today’s challenge. 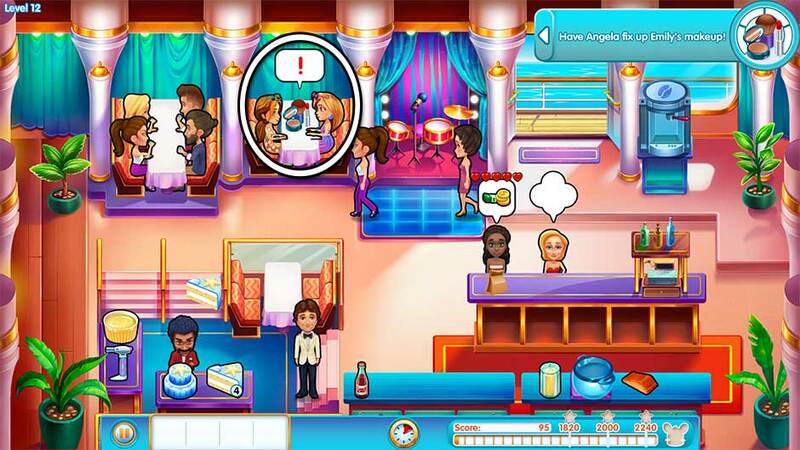 Level 57 – Happy Endings! Surprise your passengers with a sweet parting gift! Bring pralines to table customers with their order. The pralines come in a heart-shaped box and are located beneath the counter. Bring a box of pralines to a group of table customers with their order to count toward today’s goal. Do this a total of 4 times before the end of the day to complete today’s challenge. Level 58 – Wave for Goodbye! Can we get through this day with dry eyes? Say goodbye to your passengers today. Each set of memorable passengers will stop by to say goodbye. When they appear in the Lobby and a “!” bubble appears over their head, click on them to wish them well. Do this with all 4 passengers to complete today’s challenge. The lobby was going to end up in a mess sooner or later. Find the passengers’ belongs scattered around the Lobby. Their locations are shown below. Find all 11 items before the end of the day to complete today’s challenge. What could the captain and Stacey be talking about? Eavesdrop on the conversation! When Stacey and the Captain appear and a “!” bubble appears over their heads, click on them to listen in on their conversation. Keep in mind while you’re listening, you won’t be able to serve customers. Listen in on their conversation 6 times before the end of the day to complete today’s challenge. Congratulations! 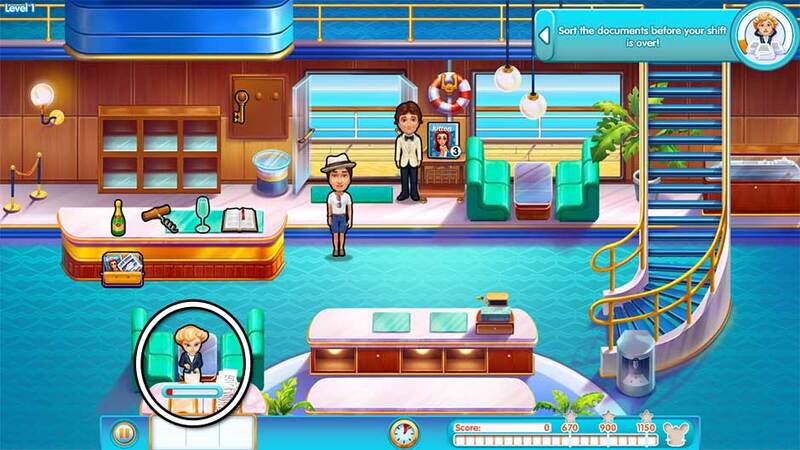 You’ve completed The Love Boat Platinum Edition! In addition to The Love Boat’s 60 story levels, there are 30 bonus levels for you to complete. This section lists every bonus level as well as strategies, tips and tricks on how to complete them. Bonus 1 – Early Bird! Make sure that Julie warms up for the long cruise by walking around. Have Julie walk 800 steps over the course of the day. The easiest way to accomplish this is to alternate clicking between the cash register and the magazine restock drawer on the upper left whenever you’re not serving customers. Keep her on her feet and you’ll finish this challenge with ease. Bonus 2 – Caution! Wet Floor! Gopher is clumsy with the bucket. Clean up after him. Mop up the puddles before Stacey gets angry. Every time Gopher moves or goes to clean a table, he’ll leave a puddle behind. Quickly click on the puddle to clean it up before the meter above it empties. Julie is the one who will be doing the cleaning up after Gopher. Place priority on cleaning the puddles whenever they appear. Customers can wait, Stacey can’t! Bonus 3 – Bird of Prey! Keep your head down or you might drop your tray! If you get hit by a seagull, you’ll lose the items on your tray! The rogue bird will fly back and forth throughout the day. There’s not much you can do to avoid it, so play as per normal. If the seagull hits you, keep calm and carry on. As long as you get through the day with a score of 1,400 or higher, you’ll complete the challenge successfully. Tip! Getting hit by the seagull will cause Isaac to stop everything he’s doing. This includes walking from one location to another. If hit, you’ll need to click on the location where you wanted to go again. Only the best service is acceptable! Only ecstatic customers will give you points today. Ecstatic customers are customers with 5 full hearts above their head. To earn the highest scores, it’s important to serve customers full orders of all the items they ask for. The faster, the better! Tip! It’s better to check out ecstatic customers as soon as they arrive at the register instead of waiting for other customers to show up. Otherwise, they may no longer be ecstatic, and then you won’t earn any points! Bonus 5 – Perpetual Motion! Isaac wants to see the cruiser leave the harbor; he’s in a rush! Keep moving! Don’t stand still for longer than 8 seconds, or else you won’t complete today’s challenge. To keep Isaac moving, alternate clicking on the cash register and the restock basket for the inflatable balls. He may shake his head, but this is the best way to keep him moving without crossing long distances, leaving you more readily available to help customers as they order. Bonus 6 – Heat Wave! The sun is burning, and the customers are thirsty. Focus your service on the slower customers. Slower customers will enter with red “!” marks over their head. When they order or wait to pay, their order bubbles will be filled with color that will gradually drain. Make sure to serve them before all the color drains from their bubble. Normal customers and table customers can wait. Bonus 7 – Slow Down! It’s one of those days where you just have to take it slow. Everything will take more time to prepare today. Restock your cake immediately at the start of the day. Try keeping popular items, like cola, wine, and a serving of pasta on your tray to save time and stay ahead of the game. Bonus 8 – Breathing Wild! Stacey’s requests are tiring. Find any moment you can to take a break! Isaac is exhausted. Don’t let him tire himself out today! Any action – whether walking or preparing a dish – will take up his energy. The lower his energy, the slower he’ll move. Today is all about balance. Try pacing yourself and serving customers in paced groups. Take a break every few seconds. In the long run, it’ll make you faster. The sun is burning and it’s affecting all organic products. Deliver items before they go bad. You have approximately 7 seconds from the time you pick up the product to the time it spoils. Fruit bowls and drinks will both go bad. Photos and hats will not. If the item starts to go bad, it will begin blinking on your tray. At that moment you will only have 1-2 seconds left. Quickly deliver it or remove it from your tray before it spoils! The best tactic to use today is to keep an eye out for orders with drinks and fruit bowls. Serve them separately if need be. Remember you only have a handful of seconds. Bonus 10 – Tip, Please! To earn your pay by tips alone is hard, but Isaac is determined to dazzle every customer with his skills! Only tips count toward your score today. Serve full orders and quick orders to earn tips from individual customers. 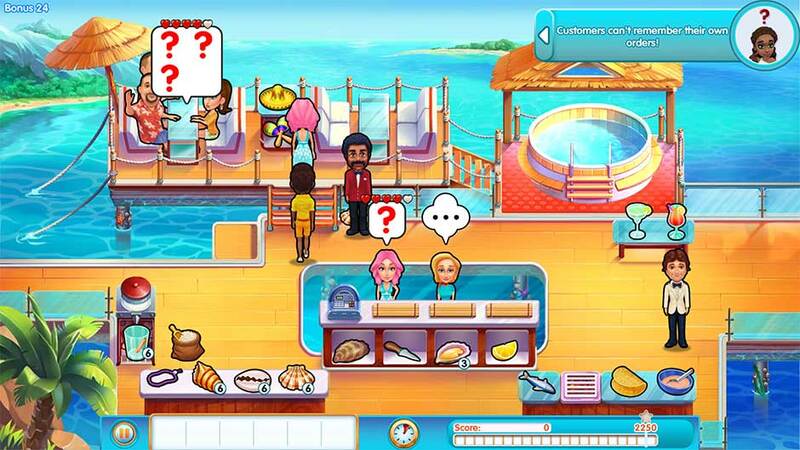 Check multiple customers out at the same time at the cash register to earn combo bonuses. Everybody loves Isaac’s food and drinks. They just can’t get enough of them! Table customers will be placing 2 orders in a row every time today. After serving a table’s first order, the table will eat, then request the second. Bring them their order, keeping in mind that you’ll need to be quick. Any previous hearts they lost will not replenish the second time around. Isaac wants to try a new serving technique. Let’s see if it pays off! Alternate completing orders between seated and standing customers. This challenge is particularly tricky – you’ll need to keep close track of which customer you served last: table or counter. If you start with a counter customer, you’ll need to serve a table next, followed by another counter customer. If there’s not another counter customer (or table if you did it the opposite way), you’ll have to wait for one to show up, or else you’ll fail today’s challenge. If you find yourself with, for example – two counter customers by the end of the day and no more tables, you’ll need to let one leave angry to complete the challenge. Tip! Circle the next customer you need to serve with your cursor, or hover the cursor over them. This will help you keep mental track of which customer type you’re currently serving: standing or sitting. Isaac is tired and not quite himself today. He’s having a hard time keeping up with all the customers’ orders. Today’s challenge is to remember your customers’ orders. A handful of seconds after a customer orders, the orders above their head will be replaced with “?” marks. Quickly memorize the order and make it before you forget what it is! It’s best to not worry too much about combos, instead making sure you serve the correct orders in a timely manner. All the patients who enter the clinic today are hungover and start with 3 hearts. The only way to increase their mood is to serve them their complete order quickly! Best not to keep them waiting at the register today, either. In and out! Bonus 15 – Who’ll Cure the Doctor? Doc doesn’t feel that well today, his arms are weak and heavy. He’s only able to carry one item at a time. Doc can only carry 1 item at a time today! That means no full order combos and no keeping extra items on your tray. If you accidentally put the wrong item on your tray, click on it to remove it. For patients who require multiple items, you’ll need to bring the items to them in multiple trips. Carl’s family on board! Can you find them all? 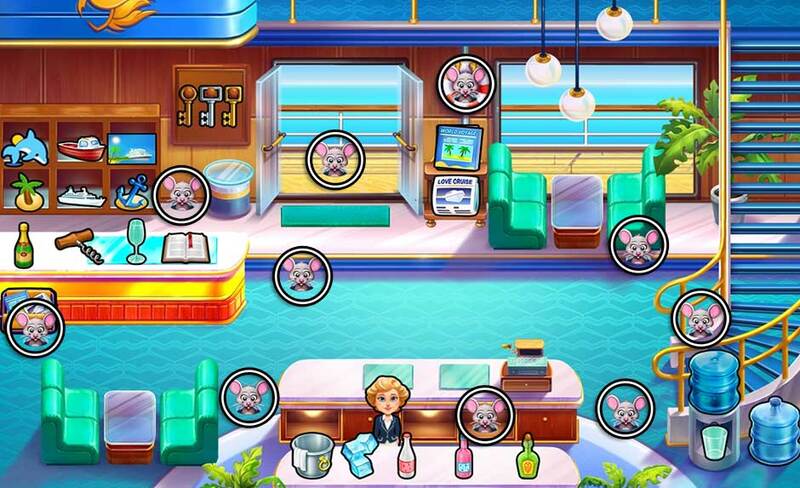 There’s so many mice aboard the ship, and you must catch them all! Catch 30 mice before the end of the day. Keep an eye out for their cute whiskers and listen for the telltale squeak. Mice will pop up in random locations. For an overview of some places where mice can appear today, visit the Mouse Locations section. Bonus 17 – No Repeats! Variety is a barista’s best friend. Don’t make the same product twice in a row today. If multiple of the same item is ordered, first pick up another item, followed by the one you need. We recommend one of the sunglasses beneath the counter, provided the item you need isn’t the same as them. The less preparation necessary, the better! There’s a nasty flu circling around the cruise! It’s best to treat those first and stop it from spreading! Treat the flu-ridden patients first. Patients entering the ward with the flu will have a red “!” mark over their head. Upon entering, focus all your attention on them! Serve them first before helping any other patients. The sickness from before seems to have caught Doc now as well. But he can’t take a day off and he can’t work fast. Doc’s feeling a bit under the weather. He’s got to take it slow. Today is just like any other day, only Doc will move and prepare items just a bit slower. Treat it like any other day and you’ll complete this challenge with ease. Doc is back in action! He’s got no time to waste, either. No time to stand around! Don’t stand still for more than 8 seconds! It’s important to keep moving today. The easiest way to keep Doc on his feet is to alternate clicking between the cash register, and the restock box for the pill bottle. This way he’ll move back and forth without you needing to remove any items from your tray, and allowing you to easily go elsewhere if helping a patient. The cash register keeps jamming! And the tune isn’t all that pleasant I’ll say! Unjam the cash register to check out customers! A “!” bubble will appear over the cash register each time it’s jammed. You’ll need to click on it and give Isaac a little time to restore it to working order. There’s a meter in the upper right corner that will keep track of how long it will take for Isaac to unjam the register, as well as how soon the register will jam again. You’ll need to unjam the register repeatedly throughout the day to check out customers. That special serving technique seems to have paid off the last time around. Now that we’re in a new place, time to try it again! Alternate between serving standing and sitting customers. This challenge is exactly like Bonus 12. Don’t serve the same type of customer – sitting or standing – back-to-back. Instead, alternate. If you’re waiting on a sitting or standing customer, keep waiting! If you serve the same type twice in a row, you won’t complete today’s challenge. Management wishes to see how effective Isaac’s work is. They’ll only count bonus tips from customers, so make sure you have enough! Only bonus tips count today! 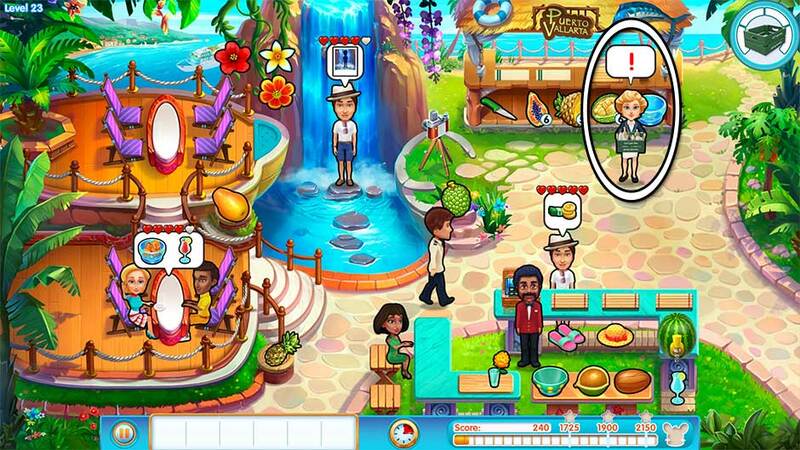 Serve quick orders, full orders, and check out customers in groups to earn tips and bonuses. 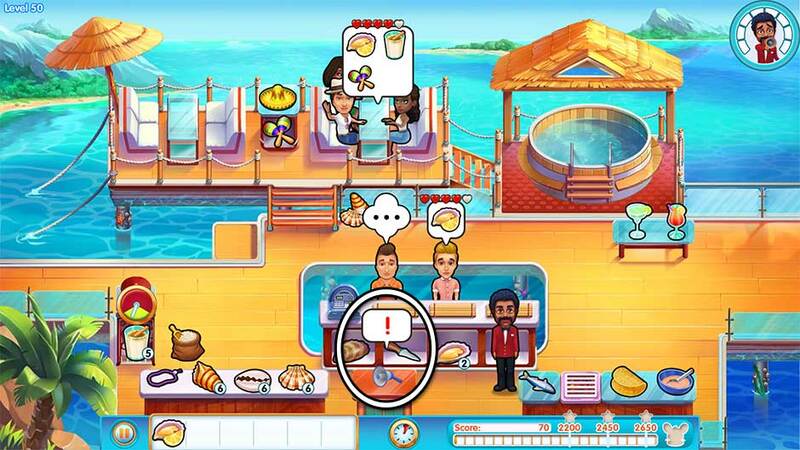 You can also choose to upgrade the restaurant at the start of the day to help give you an extra advantage. It’s one of those days, when your customers are so relaxed they themselves can’t remember what they ordered. Customers can’t remember their own orders! Shortly after ordering today, any items a customer asks for will be replaced by a “?” icon. Serve orders quickly to avoid challenging your memory too much! When in doubt, leave one “?” customer and focus on serving the others. Today is not an easy day to play catch-up if you fall behind. Tip! Restock all items at the start of the day to give yourself an extra advantage! That smug seagull is back at it, flying around like he owns the place! He doesn’t even look where he’s going! Avoid the seagull or you’ll drop your tray! A rogue seagull is flying around the restaurant today. If he collides with you, you’ll drop everything on your tray. A collision with the seagull also means Isaac will stop whatever he was doing and wherever he was going, so keep on top of your tasks to pick back up easily. The seagull’s flight path is somewhat random, so be ready for the unwanted encounter at least once or twice today. Bonus 26 – Fragile Equipment! Someone seems unable to keep proper inventory and left a bad tray around. What foul luck you had to take one! Play with a breaking tray. Throughout the day, your tray will steadily break and become smaller in size. Make sure you serve full orders at the start of the day, because you won’t be able to earn this combo type by the time the end of your shift is near. Be ready to make multiple trips the later it gets in the day. Bonus 27 – Wedding Festivities! The party is still going on, lovebirds or not. Serve all the customers and don’t let anybody leave angry. Today’s challenge is all about management. Focus on one table at a time. Serve a full order, then follow through with the next order. If you notice a particular item that takes extra time to prepare is popular, try keeping an extra portion on your tray to serve time. The crew seems to be hoarding all the magazines. Be careful not to run out of them! Don’t run out of magazines today. Newspapers also count toward today’s challenge. To make things more difficult, crew members will show up and remove all the magazines from the rack. Keep an eye out for them and whenever you see a 0 in the bottom right corner, quickly click on the restock drawer on the left to replenish your stock of newspapers or magazines. Tip! Restock the magazines at the start of the day to give yourself an edge! Bonus 29 – Gopher in Trouble! Some people pack too much for a cruise. Help out Gopher with the heavy ones. Help Gopher with the luggage. Every time Gopher needs help, he’ll stand at the base of the stairs and a “!” bubble will appear over his head. Click on Gopher to help him with the luggage. Keep in mind this will keep Julie busy for several seconds. It’s best you check out any customers waiting at the cash register before helping Gopher. Bonus 30 – Boss on Deck! Don’t waste any products or have any extra, do not overspill a glass, bring only full orders, and make sure all your customers are ecstatic! Play the perfect game! Keep items in stock and make sure every customer leaves happy. Remember! Full orders, quick bonuses, and combo checkouts will all help you with your score. Don’t forget you can also upgrade the Lobby to help your day go just a bit easier. Congratulations! You’ve completed all the Bonus Levels! Find 60 mice hidden throughout The Love Boat’s levels 1 – 60. Carl the mouse is back, but with a twist – where he shows up, no one knows! 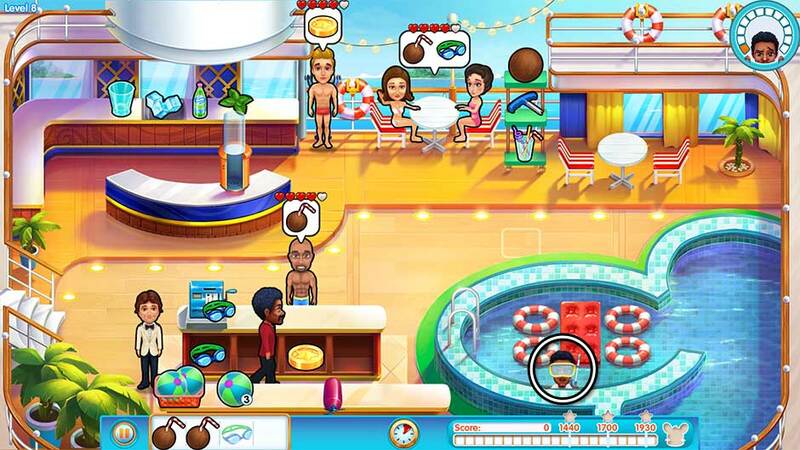 The mouse can appear in several random locations depending on the level location (Lobby, Pool, etc.). Use the screenshots below as reference to see where Carl may appear. 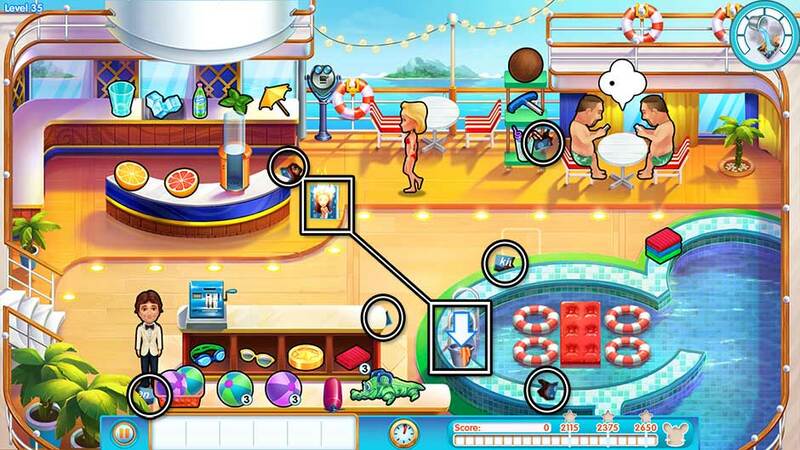 Keep a few mementos of your memorable trip aboard The Love Boat by unlocking photo achievements! There are 20 trophy achievements to unlock. Click on the trophy icon in the upper right corner of the level select map to view achievements you’ve unlocked and your progress. All Aboard Finish Chapter One. 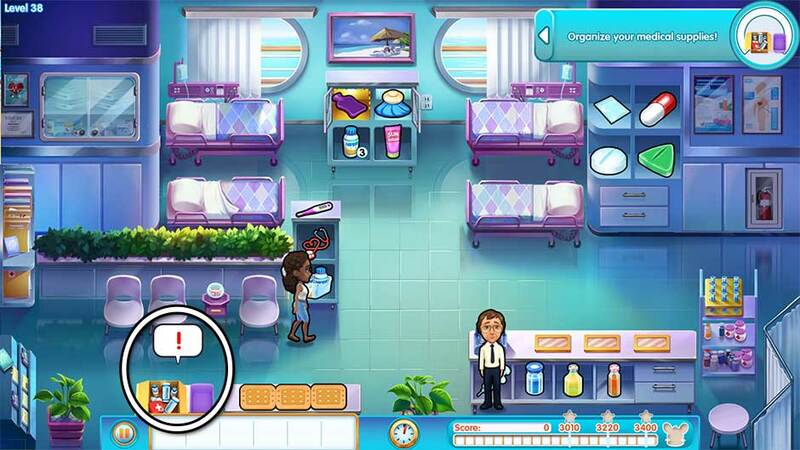 Complete story levels 1 – 10. A Rising Tide Finish Chapter Two. 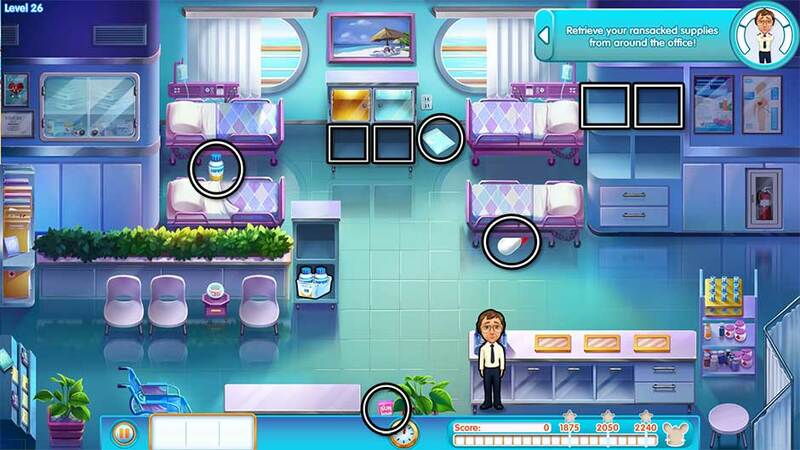 Complete story levels 11 – 20. Troubled Waters Finish Chapter Three. Complete story levels 21 – 30. Head Above Water Finish Chapter Four. Complete story levels 31 – 40. Anchors Aweigh Finish Chapter Five. Complete story levels 41 – 50. Sea Change Finish Chapter Six. Complete story levels 51 – 60. Hide and Squeak Find all 12 different mice during gameplay. Unlock costumes for Carl and sometimes the mouse will show up in a level while wearing it! His costume appearance and the level they appear on is random. 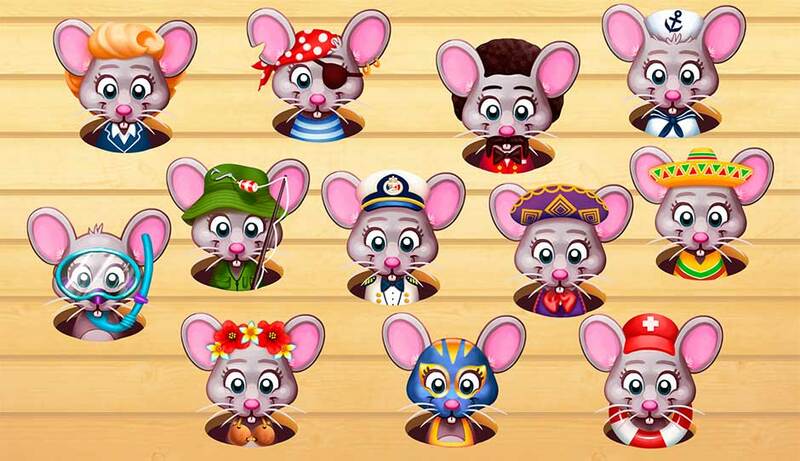 Collect all 12 different mice variations while playing. 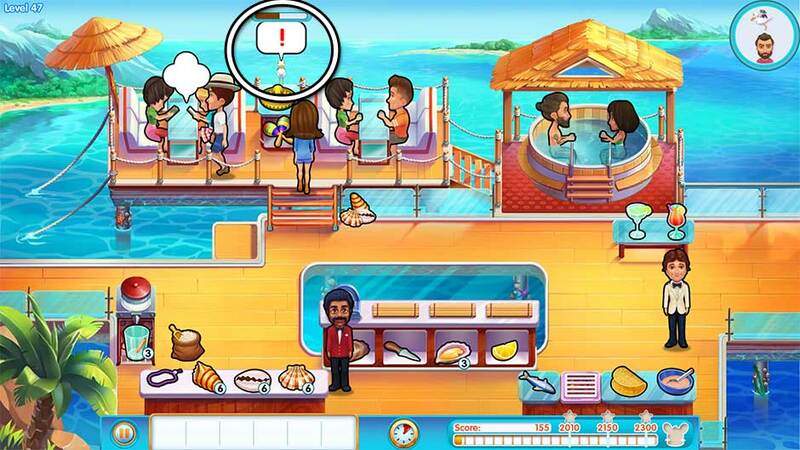 You will need to complete the achievement Family Cruise before you can complete this achievement. Life’s a Beach Achieve 3 stars on all levels. Complete all levels with the highest star score possible. 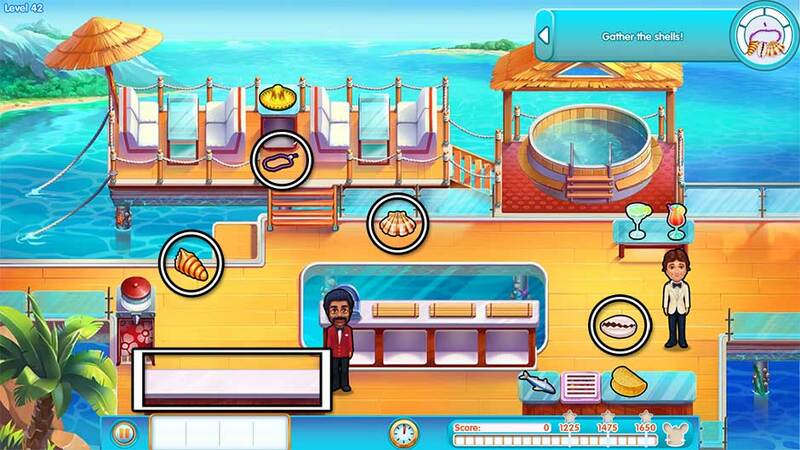 Know the Ropes Successfully finish all tasks and bonus levels. Earn every diamond in the game! 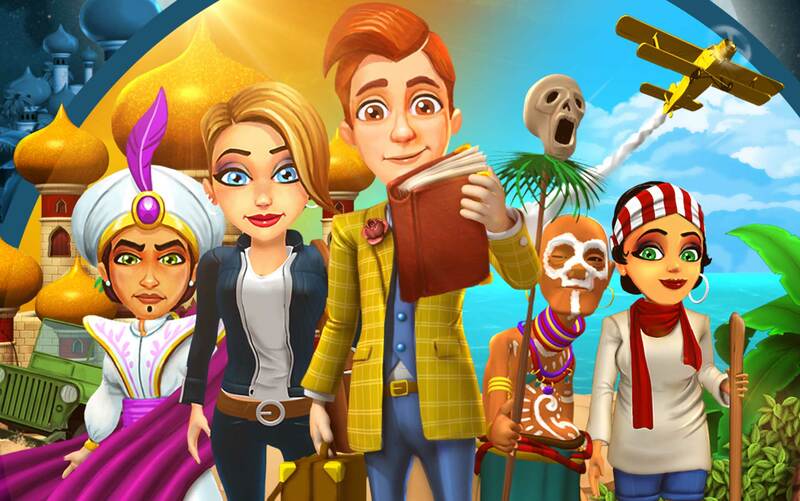 Complete the task of every story level and each bonus level challenge. Castaway Unlock all of the cast. Complete levels to unlock the cast. Click on the clapperboard in the level select map to view your progress. Smooth Cruise Have 500 customers leave happy. Check out 500 customers with 4 hearts or higher. Mouse Out of Water Find all 60 mice. 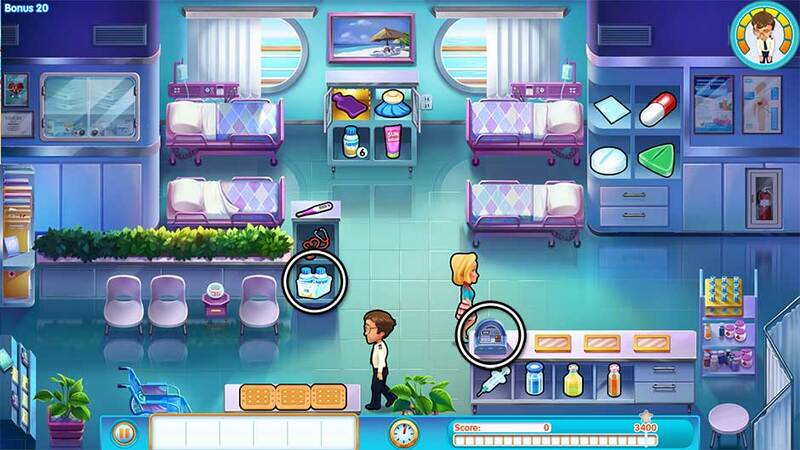 Find the mouse hidden in each of the game’s 60 story levels. Their locations are revealed in the Mouse Locations section. 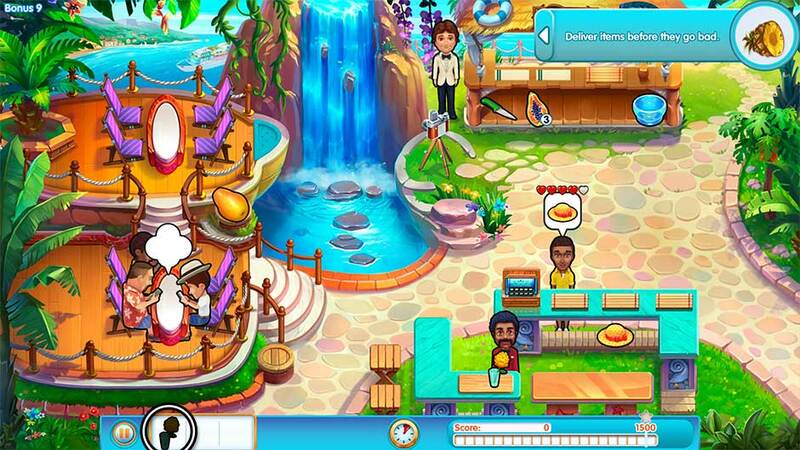 Chief Purser Earn 1,000 bonus tips. Earn 1,000 bonus tips. Photographsea Take a picture of every customer in Puerto Vallarta. Take a photo of every type of customer in Puerto Vallarta. This applies across multiple levels. Captain Keep the Captain’s table happy throughout days 13, 14, and 15. 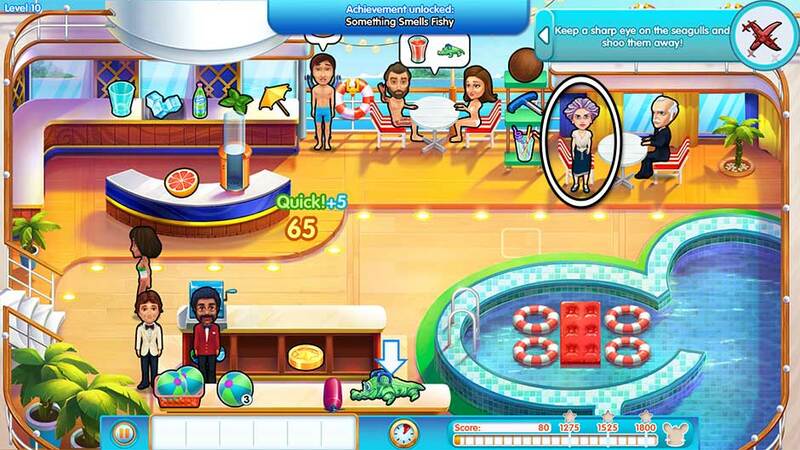 Finish levels 13 – 15 with the Captain’s table having 4 hearts or more. 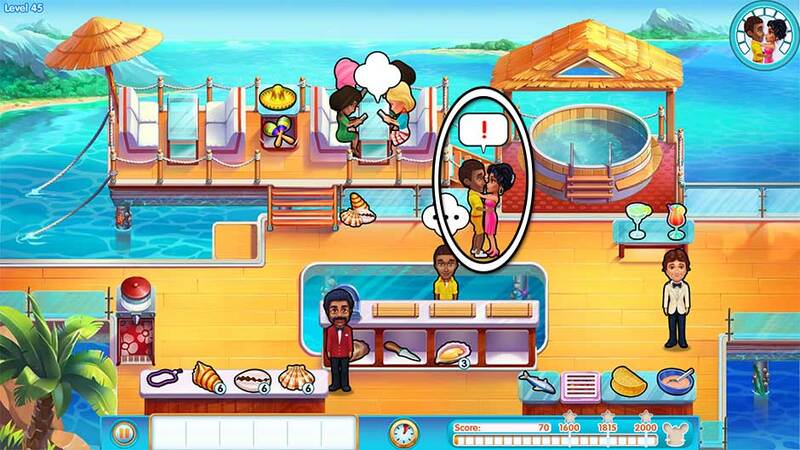 Cruise Director Finish a level with all customers leaving with 5 hearts. 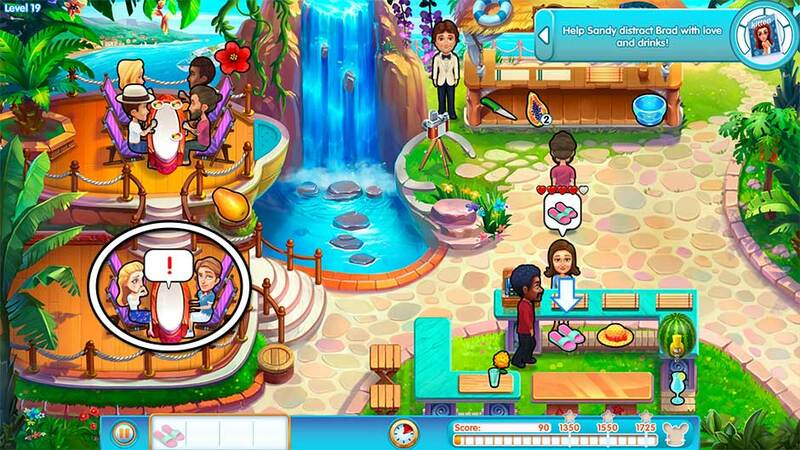 Finish a level with all customers leaving with 5 hearts. This is easiest to complete in the first level of each location. It’s also the challenge goal of Bonus 30. Family Cruise Unlock all of the different mice. Use diamonds you’ve earned to unlock special costumes for Carl the mouse. Click on the diamond icon in the upper right corner of the level select screen. Unlocking a costume will allow the mouse to randomly appear during a level, sometimes wearing a special costume. This is necessary to unlock the achievement Hide and Squeak. Man Overboard Find Ron a total of 50 times. Find Ron 50 times on the stowaway level. Luxury Cruiser Buy every upgrade. Purchase every upgrade in the game. 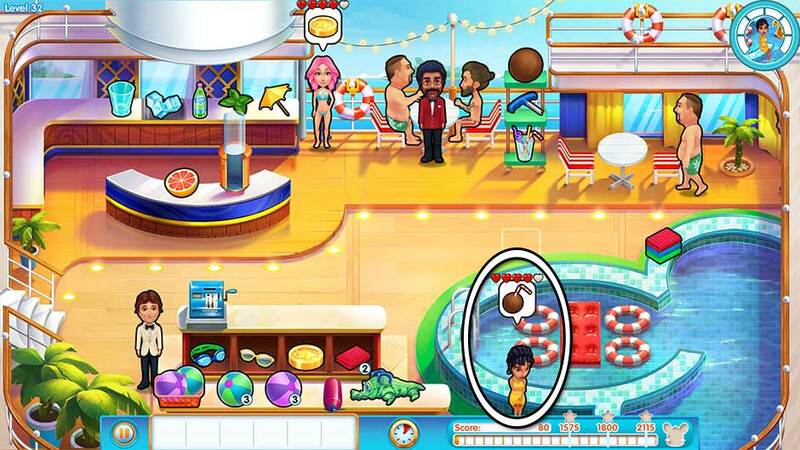 Upgrades can be purchased after selecting a level in the level select map and before pressing Play a second time. Something Smells Fishy Seagull pooped on Stacey’s head. Play Level 10 and fail the objective to unlock this achievement. If you need additional help, are having trouble with the game, or simply need a few extra pointers, our Customer Support team can help! SOS – Send a support ticket! The Love Boat Official Walkthrough is meant as a guide and does not contain cheats, hacks, or serials.